PoPville » Tribe Fans!! Check it – Jarobi White will be a guest chef at Pow Pow and after party at Sticky Rice Saturday! Tribe Fans!! Check it – Jarobi White will be a guest chef at Pow Pow and after party at Sticky Rice Saturday! 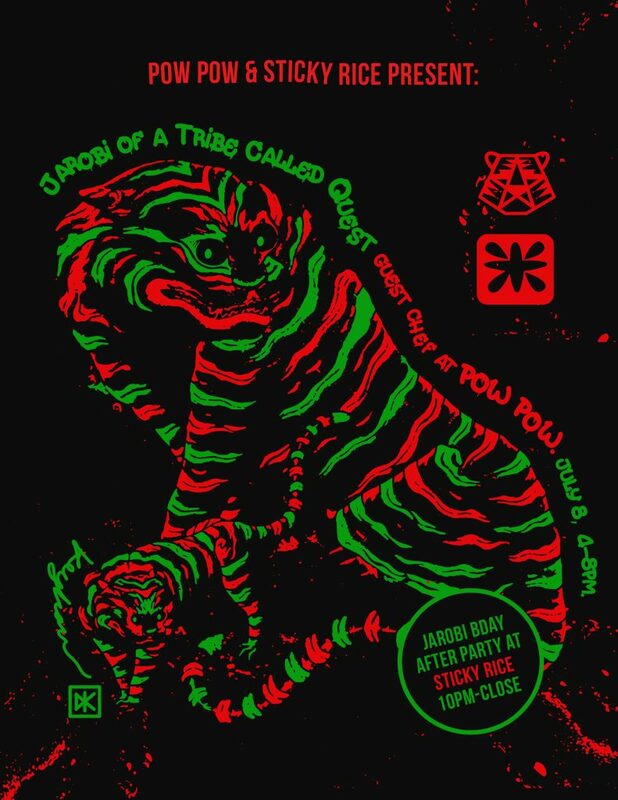 “World famous rapper and renowned foodie, Jarobi White of the recent billboard chart topping group, A Tribe Called Quest will be our guest chef at Pow Pow on Saturday 7/8 from 4pm-8pm. We will also be doing an after party for the Pow Pow event, across the street at Sticky Rice later that same night 10pm-close. Jarobi’s talents go well beyond his obvious involvement in the Grammy nominated, A Tribe Called Quest. Jarobi has also made a huge impression in the food world, as featured in the Michael Rapaport directed documentary, while also working with famed chef, Marcus Samuelsson and Jarobi’s own traveling food event, Eats, Rhymes & life.